Any type of screw can be used to fix things in masonry as long as a suitable wallplug is used as well. Originally, wallplugs were made only from fibrous material which was fairly difficult to drive screws into and gripped the sides of the hole poorly, often turning with the screw. Nowadays, most wallplugs are moulded from plastic and some will take special screws you hammer in. All wallplugs are used in much the same way – you drill a clearance hole in the wall to fit the wallplug, and then drive in an ordinary wood screw. As the screw goes in it forces the plug to expand and grip the sides of the hole. The size of this hole has to be just right for the wallplug – you should have to push it home with your thumb or tap it home with a small hammer. It should not go in too easily or it will not grip the sides of the hole when the screw is turned. With some types of wallplug, choosing the size is simple – you use the same size screw as plug as drill 8 gauge screw in a size 8 plug in a hole drilled with a No 8 masonry drill. Most plugs, however, can accommodate a range of screw gauges -4 to 8, 6 to 10, 10 to 14, for example. So by careful selection, two different sizes of masonry bit and wallplug should be enough to cope with almost all jobs. Most wallplugs will have instructions – on the packing or on a plastic strip -which tells you what size of masonry drill to use (sometimes a masonry drill is sold with the plugs). Where a plug covers a range of screw sizes, you use a slightly smaller drill for the smaller screw sizes to ensure that they will grip the plug properly. You will, of course, have to drill the depth of hole to suit the plug rather than the screw – do not try to shorten moulded wallplugs as you could reduce their effectiveness. The two main types of plastic wallplug moulded and extruded – need slightly different techniques to use them. Extruded plugs are always straight the whole length of the plug is uniform in shape and size. When using this type of plug there are two very important pre­cautions to take. First, make sure that the length of the plug used is sunk into solid masonry – if the plug is flush with a plastered or tiled surface, the expansion as you put in the screws can cause crack­ing. Secondly, do not drive the screw in so far that the shank is forced into the plug – it will get very tight and may snap. So for such plugs the hole must be drilled sufficiently deep to accommodate both the screw shank (unthreaded portion) and the plug length. Some sort of punch (often the tip of the screw) is required to insert the plug sufficiently deep in the hole. Extruded plugs are sold in long lengths: you cut off the length you need. Moulded plugs can be much more con­venient to use. Many have a recess at the top to accommodate part of a counter­sunk screw head and a wide enough hole beneath this to accommodate the screw shank. The bottom portion of the plug has a tapering hole – tapering more sharply than the threaded portion of a screw so that the plug will expand out to grip the sides of the hole as the screw is driven home. This means that these plugs do not have to be pushed deeply into the hole to avoid cracking or to get the best grip. Many have a small lip around the top to stop them disappearing down a hole which is too large, and some have expanding ‘wings’ to prevent the plug turning in the hole. There are special plugs designed for use in lightweight concrete blocks found in many houses. One type expands the centre of the plug rather than the end in much the same way as a hollow wall fix­ing. The other type actually screws into the block – it has its own plastic thread on the outside of the plug. Another very useful type of plug is the frame fixing. This has a long section which will take the shank of its own screw without expanding and is specifically designed for fixing door frames. 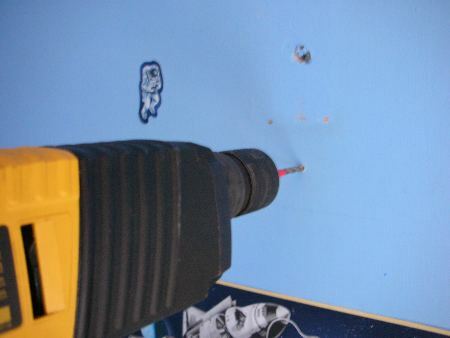 The hole in the wall can be made through the hole in the door frame (with the same drill if you use a ‘universal’ drill bit) and the plug put in with the door frame in place. This saves the tedious and often inaccurate – business of marking the hole, removing the frame, drilling and plugging and then attempting to put the screw in the plug. A countersink on the plug stops it going into the frame. Plugging compounds can be used to fill large or badly drilled holes that would not hold a wallplug. You soak the compound in water, fill the hole, make a hole for the screw and drive it in part way. After 30 minutes, the screw can be driven home. Where there is a need for a particularly strong fixing – garage doors, con­servatories, heavy kitchen cupboards, etc. 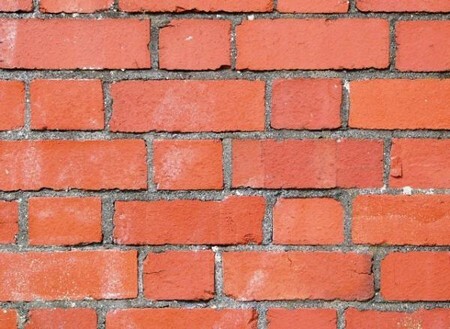 you may need to use a solid wall anchor. These have their own bolt (or other fixing such as a hook) and tighten­ing the bolt expands the anchor to grip the sides of the hole. A normal expansion bolt needs a larger hole than the hole in the fixing; a through-bolt uses the same size.